Chad Bettis struggled early and dominated late, winning for the Rockies Friday night. Credit: Kevin Jairaj, USA TODAY Sports. 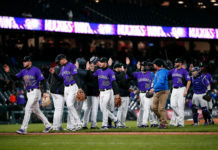 After a homestand that saw the Rockies go 4-3, Colorado began a six-game, divisional road trip with a 3-2 loss to the San Francisco Giants Tuesday night. 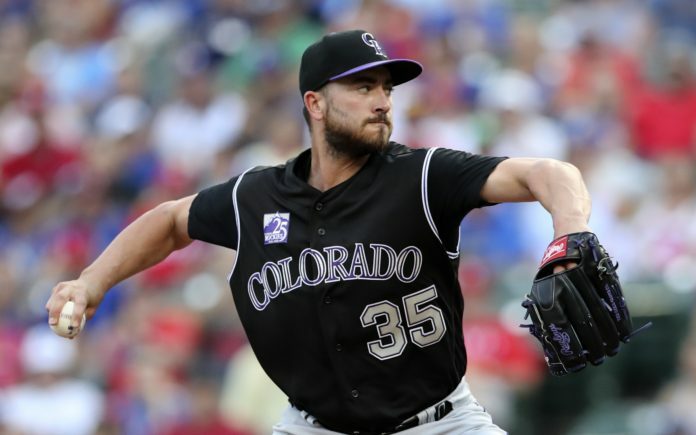 Starting pitchers Chad Bettis and Derek Holland controlled the majority of the game before the Giants (41-39) tacked on runs in the seventh and eighth innings to secure the victory over the Rockies (38-41). Ian Desmond began the scoring in the second inning. After falling behind by two strikes, Desmond took a ball before barreling up a slider into the left-center-field bleachers. The round tripper was Desmond’s 16th of the year and gave the Rockies an early 1-0 advantage. Colorado looked primed to build upon the lead in the next inning after putting runners on first and third with one out. Charlie Blackmon shot a rocket right at Giants first baseman Brandon Belt, though, who easily trotted over to first base to double up D.J LeMahieu and end the threat. The lead was short-lived as Gorkys Hernandez led off the bottom of the third inning with a solo home run to center field. Hernandez – who failed to hit a single home run las season – now has 10 on the year, including four against the Rockies. The Rockies squandered another magnificent scoring chance in the top of the fifth inning. 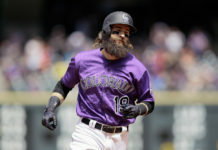 Carlos Gonzalez singled to center field – extending his hitting streak against San Francisco to 17 games – and Tom Murphy advanced him to third with a single of his own. However, Gerardo Parra and Chad Bettis struck out and LeMahieu popped out to center to strand both runners. 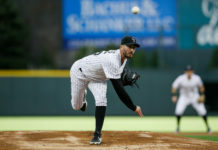 While the Rockies continued to threaten, Bettis remained steady as the night wore on. He sent the Giants down in order in the fifth inning and struck out two more in the sixth, reaching the mid-90s on his fastball. In many cases, though, Holland was equally as impressive for the Giants. Despite running into traffic, the lefty kept his pitch count low and steered clear of the big hit. He pitched 6.2 innings, allowing just one earned run with eight strikeouts in the no decision. Bettis encountered some danger in the seventh inning after allowing the first two batters to reach base. He got one out before issuing an intentional walk to Buster Posey to load the bases. That marked the end of his night as Bud Black brought in Adam Ottavino to escape the trouble. Though Ottavino got Andrew McCutchen to fly out to left field, Gerardo Parra’s throw came in just behind Austin Slater, whose head-first slide gave the Giants a 2-1 advantage going into the eighth inning. In the next half inning, Trevor Story kept the inning alive with a two-out single to right field. Desmond followed him up with a liner to right field that eventually got passed a charging McCutchen. Story hustled from the crack of the bat and came around to score the tying run. Ottavino struggled with command in the bottom of eighth inning as the potential all-star issued three walks, the last coming with the bases loaded to walk in the go-ahead run. The drama continued into the final frame where Murphy led things off with a bloop single-turned-double as the ball caromed off Hernandez’s glove in center field. After recording an out and issuing a walk, Giants closer Sam Dyson got LeMahieu to ground into a game-ending double play. In total, the Rockies stranded 10 runners on the night and never came up with the hit to break the game open. Ottavino allowed one earned run in 1.2 innings of work, picking up his first loss on the season. Game two of the three-game series will commence at 8:15 p.m. MT Wednesday night.